In the game buildings do several things: they require Titans to activate sensors to place them (and score points for placing them), instead of increasing the Titan's initiative, and once on the board they can block lines of sight and paths of movement. Titans with a rapacious personality get bonus VPs for smashing them, and Titans with a gracious personalty get bonus VPs for them surviving till the end of the game. The basic notion is the situation or battlefield in which the Titans engage is just as important as the Titans themselves. However, the buildings I'm inclined to think about at the moment include the Shield Generator building, the Power Generator building, and the Weapon building. These would essentially replicate the behaviour of the Titan's internal systems. However, the game is drive by a deck of cards representing the Titan's internal systems and crew. So I'm wondering if these should just be like 'external' systems in that they function like Shields, Plasma Capacitors, and various Weapon systems, or whether they should be linked into the Titans differently than just being another card in a Titan deck. 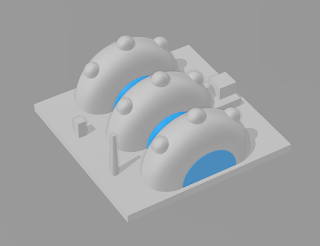 The special buildings would be area effect, providing a bonus to models that are adjacent to them. I agree that these sorts of buildings are best kept simple, by giving bonuses to models next to them. I'm not sure of the context of the buildings so this might not be relevant, but having petrol stations that explode would be a nice touch (not that a petrol bomb would damage a titan, but the smoke might have an effect). I would go for giving bonuses or penalties to adjacent models and effects when destroyed, if you want to put variety in the buildings. nuclear power stations which make a permanent danger zone when destroyed. that sort of thing. high points for putting it down, but more of a risk in doing so. Until I read through your rules (which is on my to-do list, as this sounds really interesting!) I can't offer any more tailored advice. That's a little tricky where the building is essentially a turret, not in the Titanomachina sense, but in the sense of turret-defense games. Likewise the Shield Generator could put shield tokens on surrounding squares, but it's still a bit iffy when and how. The Power Generator would be the easiest for that, allowing systems to be activated at one less charge or something. I don't see the issue. Each building gives a little bonus to the first adjacent model via the card. Why does it have to be more complicated than that? The game 'works' by players activating systems in an initiative order, and then resolving those system-activations in the initiative order again. Systems are activated by playing one card, the system to be activated, face up, and other cards face down. Adding the Power Generator into this by having it act as a bonus to the number of cards played face down works, in theory. A Shields system on a Titan allows the Titan to place or move xD6 shield tokens when activated, either on its dashboard or the board. A Shield Generator building could act like there's a shield token over each adjacent building or Titan. A little inconsistent, but not really an issue to me, especially as there's less work for the players to do with shield tokens. A Weapon system on a Titan is used to attack targets such as buildings and Titans. Having one act as a turret raises the question of when it attacks, and what its arc of fire might be. Like would it have a card in a Titan deck? In which case, would it just be treated as a weapon on a building rather than on the Titan? Seems logical too, after a fashion. An alternate notion would be like the fake buildings in Evangelion where the Evas get fully-loaded weapons cached in inocuous buildings. The practicality of swapping out an existing weapon from the deck of system & crew cards seems like a hassle though. Let's focus on the Shield building. If Shields normally give Xd6, what if the Shield Building gives +1d6 tokens, upgrading from Xd6 to (X+1)d6 tokens. Or it allows you to re-roll the d6s. For the Weapon building, the Titan counts as being armed with whatever weapon the card has. Or you simply count the building as a Titan and activate the turret instead of the Titan weapon - both are the same size on the board, so I don't see the issue. If you want to have it be a swap, that creates a sub-game of trying to find the "best" weapon, looting instead of fighting. I'd avoid that. Any of these can be easy. IMO the issue is that you have some rigidity, where you're trying to make a square peg fit in a round hole. It would be nice if they built-out from the existing rules, but likewise there's some advantages to passive bonuses rather than more stuff that the players need to actively manage. So a Shield Generator building providing a passive equivalent to a shield token means less mucking around with shield tokens. Likewise the Power Generator. I'm getting sold on those. There's wiggle room for more or less bonus and so on. Weapons can't really provide a passive bonus with how they're handled in the game (engage targets within range, line of sight, and arc), rolling xD6 (removing the highest results for each shield token on the target), and picking the highest. 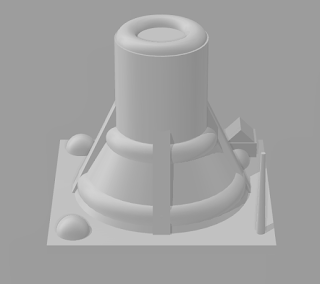 My hope was for a piece to either replace the building top, or as I think about it more, to rest on top of a building top that would support the plug-and-play Titan weapons. One thought I had was to have Titans activate a Sensor system that would then allow the Titan to attack with whatever Weapon building was line-of-sight and arc of that Sensor system on the Titan. That solves the production issue of making up cards for Weapon buildings. The best alternative so far, as you mentioned, is just adding the Weapon system to the Titan deck and playing it as an on-board system with its position on the board reckoned from the building model rather than the Titan. Would it be an idea to have weapon/turret buildings attack the same target as the titan, with relatively weak weaponry? essentially it will add an area (defined by the range of the weapon) where the enemy titans will take a little more damage when you attack them. the targeting for the turrets would be to just attack the same target as the titan that placed them. Again, I haven't read the rules yet, so I don't know if this would have to be a separate attack or if it could just add to the attack of the titans weapon. Then you essentially have an aura of take more damage (turrets) and an aura of take less damage (shields), which is an easy one to work with. Perhaps have turrets strip 1 shield before the attack is resolved? It seems like an idea, but the notion is that the Weapon models that can be mounted on Titans can be mounted on the buildings. Bonuses to attacks are certainly an interesting notion, and might be an idea for a 4th type of building as a passive effect, but as a bonus to existing weapons it's a little odd. Why a building-mounted Plasma Howitzer would give a bonus to any attacks by a Titan-mounted Hand is difficult to rationalize given how the game is structured as stuff being activated. I think in terms of the weapon buildings the easiest way to do it is to have the weapons on Weapon Buildings (need a better name) be a weapon in the Titan's deck that isn't mounted on the Titan. So players use them the same, except the attack is from the building's position on the board and not the Titan. It simplifies figuring out the Human Resources (HR) cost as being HR cost of the building and the weapon together. That the building needs to be discovered by a Sensor system should cancel out the positional advantage. It makes it inconsistent with the Shield Generator and Power Generators, but keeping those as having passive effects does mean less of a hassle. I'm entertaining notions of tying the effects of those two into their size. The thing now is figuring out the HR cost of tying in the existing building effects with passive bonuses. The notional Power Generator bonus of reducing the charge cost of activations is pretty sizeable. Weapon Building: As Weapon (model plugs in, weapon card added to deck) plus building. Shots resolved from building, direction of model indicates arc, size is LOS, etc. Shield Generator: -1D6 to attack building and targets in adjacent squares. Doesn't stack. Ignored by Shield Breaker weapons. +2 HR points. Power Generator: -1 Charge to activate systems in adjacent squares. Doesn't stack. +3 HR points. Comms. Hub: +1D6 to attack targets in LOS (360o arc). Doesn't stack. +2 HR points. To be honest the turret is much sexier, if such a term can be applied, than these much earlier building toppers. The Shield Generator (bottom picture) is based on the classic Empire Strikes Back shield generator that was protecting the rebel base, and that got blown up by the AT-AT assault. Where the Titans in Titanomachina essentially have their shield generators forming their buttocks, I'd rather have something rounder. The Power Generator (middle picture) is based on the original design for the Titan Dashboards including four spaces marked by hexagons where players would 'charge' their cards. Those went the way of the dodo because there was too much procedure for too little tangible benefit, but the hexagons on the system and crew cards still indicate the charge cost of playing those cards. My first thought was maybe something more like a hexagonal cooling tower, like you see on a certain iconic style of nuclear power plant. Something taller, at least. Finally, the Communications Hub kind of fits, but it's still kind of small and chintzy compared to the gorgeous turret model. I've been thinking of perhaps something more like an inverted version of the turret being a large satellite-dish like thing. I like the Comm/Sensor building as-is. The Power Generator doesn't look like anything. The hex-in-square isn't nice to look at, and the stacked hexes don't really tell me anything. I'd suggest you revisit the design. The Weapon Turret is too big for the building. 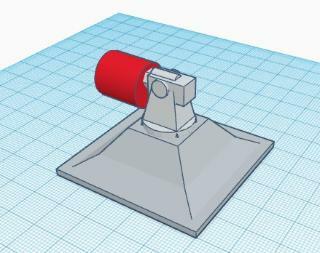 I'd shrink the turret itself, and place it atop a pyramid. The weapon-turret needs to fit the weapons mounted on the Titan. 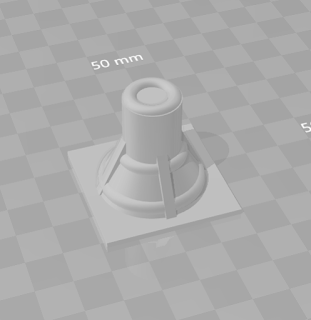 It is kind of big, and I'm going to shrink the gigantic 10mm high pedestal down to a 2mm 'plug' to match the others. In part because I rather like the turret, and in part because that's work I can do myself. I'm inclined to agree regarding the Power Generator and the Shield Generator. The revised Power Generator is *much* better. Much, much better! It would not hurt to add a small antenna and stairway access to give the roof some more texture. The revised Shield Generator is also better, although consider to merge the two designs? 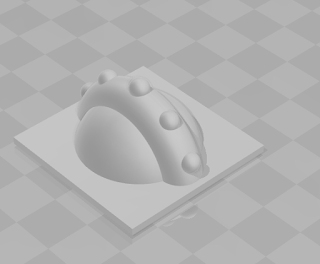 Thinking about it, I'd wrap the Hoth generator around onto a ring, radiating one per diagonal corner. It'd "obviously" be a Sheild Generator, but that sort of configuration would work better on your building toppers, giving more texture. You could put a little dome with feeders in the center. That's a two-part design, where the turret plugs into the base. Weapon in red. It's an interesting notion with the Shield Generator. I'll have to give that a try and see how it looks. The notion of the weapon-turret being mounted on more of a gimbal was my first idea for the turret, but I rather like the dome-ness of it. That said, there is a 'clipping' problem if someone places a such a building facing a taller building in an adjacent square. Originally I rather envisioned it as like Optimus Prime's arm mounted on the Empire State building from the Transformers episode City of Steel. I get that you're going for something a bit more cartoony, but if you don't want clipping, you have to backset the weapon over the base, and that is pretty much going to mandate a gymbal mount. I don't understand why you'd allow anyone to block a live weapon. I'd have the City Zoning Commitee enact a Height Ordnance Law that doesn't permit anyone to build anything taller when adjacent to a building topper of any sort! Ah, there you, you've hit on the game itself, where Titans amicably address zoning issues affecting their respective neighborhoods. If there's a co-op / competitive build city phase, Zoning can only be a good thing in forcing players to make decisions, whether to cap something or allow things to grow. It's about as amicable as you get with giant robots toting high-powered sky-scraper-crushing weapons. Buildings are placed on the board when Titans activate their sensor systems and roll high enough to put that many building wall-sections down within the system's arc and line of sight. Placing buildings scores victory points depending on the size of the building, and can block lines of sight and paths of movement. Some personalities gain extra points from destroying them, or from having them survive until the end of the game. Oh, those look great! The little bit of extra detailing really helps. The "problem" is that the 1st gen Sensor/Comm design doesn't compare well with the rest. When the previous designs were "flatter", the lack of 3-D height was fine. Really, it's a more general problem where the toppers are vastly different in volume, which strongly suggests an inherent value ranking, where the biggest towers (Weapon and Power) are far more important than the smallest tower (Sensor). 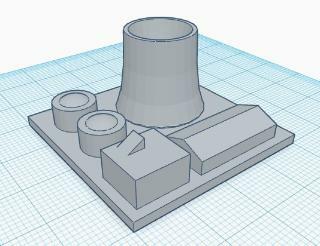 IMO, the Power Generator should have a smaller, squatter tower, shaped like a wet draft cooling tower for a Nuclear Power Plant: 20-25mm base diameter, 25mm tall, slightly off-axis, to allow for smaller cooling towers along one edge. 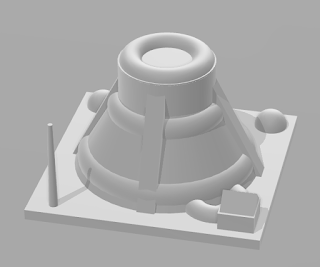 As counterpoint, the Sensor Tower should have observation towers at each corner, with a 30-35mm tall, primary radio antenna tower shaped like a classical radio mast pyramid. Run explicit connections from each observation tower to a command building, which then has a connection to the mast. And, of course, keep the greebling! It's so much better than a boring flat expanse! Yeah, the sensor one needs reworking. Just thinking of ways to represent that. Now that I've figured out how to subtract from shapes as well as add I can make more stuff, and shorten the Power one a bit. That version of the Power Generator is better! Curious, but what CAD are you using? Those look pretty cool, especially the nuclear cooling tower. Curious, but what is the ground / building scale? How tall is a person? In the back of my head, people are 2 or 3mm tall? It's 1:1000, so a hulking 2m meathead will be a hulking 2mm meathead in the game. It's a board-game, but keeping a bit of a scale helps with the aesthetics. Thanks! 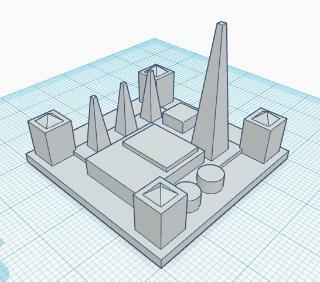 2mm is a good scale for the buildings, and is roughly what I was informally designing around (based on the corner building of your power plant). In my mock-ups, I had minimum 1mm steps & 2mm gap. Design-wise, each mock-up is designed around the one primary feature (cooling tower / antenna), with a reinforcing secondary (small cooling / array & observation) block to draw the eye in a clear way.